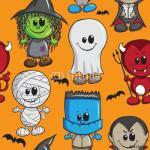 Halloween is such international and universal holiday, which is just right for all ages in different countries. From small to large, all dress up in costumes and each go to their parties. Adults – handing out candies, and then go to the places where many people dancing and along with this, they get to know each other with Bloody Maries. The children at this time get a huge portions of chocolates and other sweeties, from which then hurt their teeth (perfect earnings for dentists, huh!) and return to someone’s home to funny (or not so mush) divide these candies equally or not. Undoubtedly, while the adults are busy with their important affairs of the day, having a much greater access to many formats and types of entertainment, children also want to have fun that day. Who said that music should not be the same entertaining, as one those boring adults have? In this collection, there is everything for the mood and to make your Halloween parties no less bright! How many common games are available to spend time in a circle of your friends for entertaining sounds of little spooky melodies? As much, as you consider necessary with your fellows! Even sweeties portioning will become more attractive with such music, as, for example, Five Little Pumpkins. This kidz’ counting-down will be a wonderful background to determine who will get the biggest part!